Middlesbrough boss Tony Mowbray was satisfied with his side's defensive display in the 0-0 draw at Burnley after a poor recent run away from home. Boro conceded 12 goals in their four previous away games, which all ended in defeat, including four in consecutive matches at Ipswich and Crystal Palace. 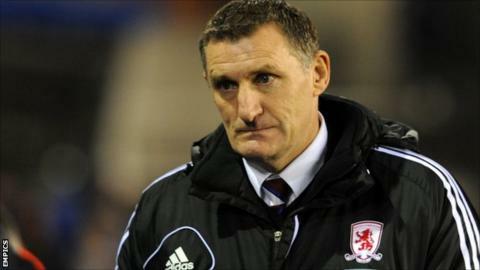 "It was important to stop conceding goals," Mowbray told BBC Tees. "The concentration levels were high, there were no soft goals, we defended corners well and we did the job." The result and clean sheet was all the more pleasing for Mowbray as three first-choice defenders were unavailable. Jonathan Woodgate, Stuart Parnaby and Seb Hines all missed the trip to Turf Moor, prompting a recall to the team for Stephen McManus. Scotland international McManus, 30, made his first appearance for the Teessiders this season as part of a makeshift back four following his recall from loan at Bristol City last month. "We did a bit of work on a potential partnership with Andre Bikey and they both applied themselves really well," said Mowbray. "Nicky Bailey played at right-back, not a preferred position for him, did a good job and it was a good honest hard-working performance that gave us a platform. "We just need to follow that up now with wins at home."